Earlier this summer I told you how I was in Kimono love. Well I still am, except I've added a little detail to the Kimono Madness : how about a longer kimono. We can call it a Kardigan or a Duster but the soft feminine feel is really what matters the most to me! I am digging the Brigitte Bailey one above because it can work over a pair of jeans, swim suit, a slip dress, the possibilities are endless. Right now, throwing them over shorts and a tank is nice and easy not to mention it adds a super light layer when you may need to cover up a bit. Slowly but surely I've developed a little love for python prints. I like the earthy yet fiesty vibe of the print. Don't get me wrong if I ever come across a snake I will high tail it out of there, but I can live with them harmoniously in the fashion world. 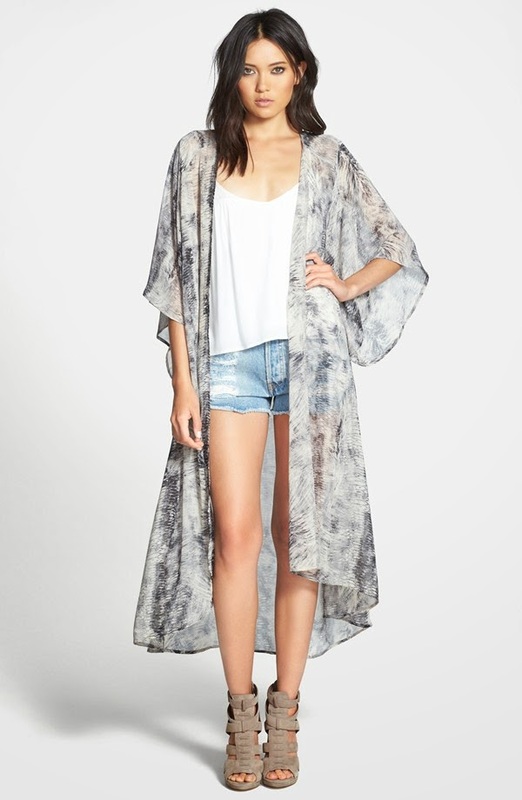 As you probably know, Nordstrom is having their anniversary sale, which is where I found the Print Duster Kimono above. They have a bunch of kimonos on their site for great prices. You might even venture into the junior area and just go up a size and get yourself a great deal. I found a gorgeous aqua one here for $44 ! Kimono Kardigans, love it or leave it? Love nordstroms, these are pretty..I see myself enjoying one of these longer kimonos as loungewear at home with leggings. I love the look of the longer ones especially with a little fringe! I think the longer ones will transition so nice into fall with some leggings/jeans and ankle booties! My daughter loves these. We saw some at Nordy's but they weren't the right color for her, so we'll keep searching.